Sotiria “Sammie” Kapsis is a school counselor by profession, which has been invaluable in her role as a volunteer at Peterson Elementary School, where she leads discussions with students on topics such as bullying prevention, empathy, respect, problem solving and friendship skills. She is on the executive team of the Indian Prairie Parents Council (IPPC), serving as an advocate for parents and students in Indian Prairie School District 204. For her dedication in supporting students, parents, and teachers, she is being recognized as the District 204 BMO Harris Bank Volunteer of the Month. “In a district where we are blessed with a strong community of caring volunteers that selflessly give of their time, it is a tremendous honor to be considered among one of them,” she said. Kapsis has been volunteering in the district since she moved to the area four years ago. Her daughters attend Peterson Elementary School and Crone Middle School. She has served as Peterson’s representative on the IPPC; she is the IPPC first vice president and is chair of the IPPC Legislative Committee. She also was a candidate for the school board, and served on the district’s Food Committee and the Bring Your Own Technology Committee. As part of the Junior Achievement, STEM and Savvy Business Kids programs, she empowers children to learn about their role in the community, how to use their strengths and to know they have a voice and a responsibility as students in the district. Her inspiration as a volunteer has been her mother, who was the first in her family to go to college and always tried to inspire new ideas in her daughter through her studies. 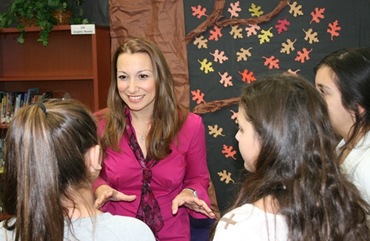 Kapsis attended school in Greece for five years and across the U.S. for the rest of her educational career, which has given her a multicultural perspective in learning and life that she passes on to her own children. Peterson Elementary School volunteer Sammie Kapsis talks with students on the subject of bullying prevention. Kapsis is the District 204 BMO Harris Bank Volunteer of the Month for November. 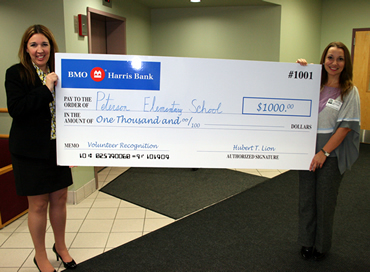 Nicki McIntyre (left), branch manager for BMO Harris Bank, presents a $1,000 check to Peterson Elementary to honor Sammie Kapsis (right) who was named the District 204 BMO Harris Bank Volunteer of the Month for November.